We tested the effect of near-future CO2 levels (≈490, 570, 700, and 960 μatm CO2) on the olfactory responses and activity levels of juvenile coral trout, Plectropomus leopardus, a piscivorous reef fish that is also one of the most important fisheries species on the Great Barrier Reef, Australia. Juvenile coral trout reared for 4 weeks at 570 μatm CO2 exhibited similar sensory responses and behaviors to juveniles reared at 490 μatm CO2 (control). In contrast, juveniles reared at 700 and 960 μatm CO2 exhibited dramatically altered sensory function and behaviors. At these higher CO2 concentrations, juveniles became attracted to the odor of potential predators, as has been observed in other reef fishes. They were more active, spent less time in shelter, ventured further from shelter, and were bolder than fish reared at 490 or 570 μatm CO2. 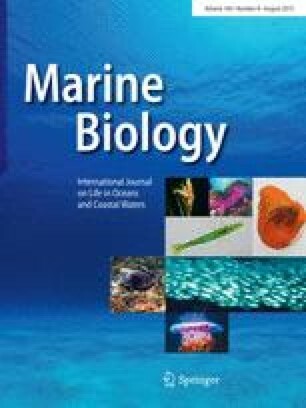 These results demonstrate that behavioral impairment of coral trout is unlikely if pCO2 remains below 600 μatm; however, at higher levels, there are significant impacts on juvenile performance that are likely to affect survival and energy budgets, with consequences for predator–prey interactions and commercial fisheries. We thank staff at James Cook University’s Marine Aquarium Facility and the Queensland Government’s Northern Fisheries Centre for logistical support. This research was supported by the ARC Centre of Excellence for Coral Reef Studies, the Australian Research Council and the adaptation research network for marine biodiversity and resources (NCCARF).